The G8 and G20 are coalitions of nations that address significant international issues. The predecessor of both coalitions was the G7, a group of seven nations that banded together in 1975 to oppose the 1973 oil embargo put into place by the Arabs as a protest against the intervention of the United States and the United Kingdom during the Yom Kippur War. The Arab nations waged war against Israel, but were unsuccessful because the United States and United Kingdom provided Israel with weaponry and military might. The U.S.S.R., which was by then on the verge of breaking up, supplied the Arab nations with weapons, and – because of this move – was not invited to join the G7. The G7 was formally known as the Group of Seven Industrialized Nations. Its members were Britain, United States, France, Canada, Japan, Italy, and Germany. The G7 was renamed to the G8 in 1997, when Russia was added to the original seven-country lineup. Ever since its inception, the G7 and G8 asserted several political and economic policies that affected other countries. The G7 and G8 became known on the international scene as the major policy-makers capable of promoting or disrupting political and economic stability. The latest instalment of the G8 is called the G20, a greater coalition formed in 1999, which includes the nations of Brazil, China, Saudi Arabia, Republic of Korea, France, Australia, China, Canada, Germany, Indonesia, Argentina, Turkey, India, Russia, South Africa, Mexico, Japan, United Kingdom, United States, and the European Union. 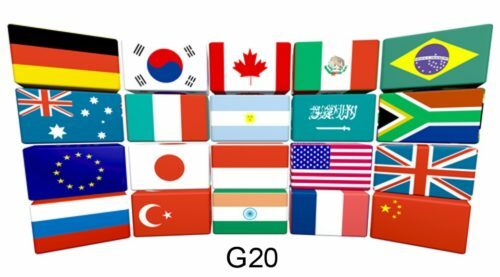 While the G20 is supposed to acknowledge all members as equals, it cannot be denied that the countries that were included in its predecessor, the G8, have an advantage over the remaining members in terms of political and economic policy-making. So far, the economic policies that the G20 has decided on since 2010 include regulations to improve bank capital, strict disclosure of compensation policies, and the setting aside of portions of compensation for performance and risk. All of these are economic measures the G20 believes will alleviate any potential future economic crises. There are many theories as to why the G8 chose to include other countries in the coalition. The first theory is that this was done for economic reasons, since many of the newly-added nations are developing countries with great potential of swaying the world economy in the future, especially the emerging powerhouse economy of China. By inviting China into the G20, other countries can intervene directly in China’s economic and political affairs and benefit from its huge economic capability. Another theory relates to the current economic crisis faced by Western countries, especially the United States and the United Kingdom. Many of the nations invited to the G20 are Eastern ones, such as Saudi Arabia, China, and South Korea, and could offer aid in the form of monetary debts to the feeble economies of the West. 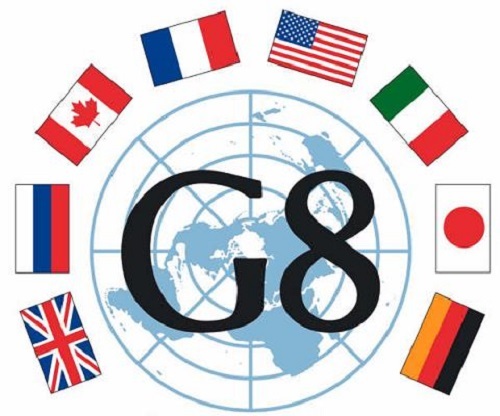 Both the G8 and G20 originated from the G7, a seven-nation coalition that included Britain, United States, France, Canada, Japan, Italy, and Germany. The G7 was formed in order to counter the oil embargo imposed by the Arab Nations due to the intervention of the United States and United Kingdom in the Yom Kippur War. The G7 greatly influenced international economic and political decision-making. In 1997, Russia joined the ranks of the G7, and the coalition was renamed to the G8. In 1999, the G8 added sixteen new nations, and the coalition was renamed to the G20. Emerging economic powerhouse China, along with two other Eastern nations, Saudi Arabia and South Korea, were the most notable additions to the coalition. Currently, the G20’s aims focus on alleviating the effects of present and future economic crises. Celine. "Difference Between G8 and G20." DifferenceBetween.net. September 27, 2017 < http://www.differencebetween.net/miscellaneous/politics/differences-between-g8-and-g20/ >. I am elated to have found this site. Uh… this is funny that the two above did not recognize this in their laudatory comments, because it jumped out at me right away; there are only (19) countries/unions listed above. China is listed twice. So who is the 20th? The missing country is Italy, although, as Germany, they are part of the European Union. Besides the banking and fees they want to keep aside to prevent future global economic downturns, there are many issues that, irregardless the political spectrum of a particular nation, are pushed through without actual consultation with the citizenry of the sovereign countries the so called leaders pretend to represent. This is a vast topic that I invite the readers to research because we are all worldwide being affected by the agreements put forth at these meeting. For instance, Internet privacy and anonymity , essential for the freely exchange of ideas, information and commerce, is considered as if it a byproduct of technology and modern times and can be manipulated at will by those who control international and domestic communications. in reality those have existed since the beginning of time, we need privacy and confidential communications as we need water or air. We used to send hand written letters with confidence that nobody will read them. So why digital communications should be any different? Industrial espionage is a crime, inventions will be stolen or will never come to be, if powerful interests see them as a threat to their wealth. On the same issue, repressive undemocratic regimes as Saudi Arabia, will never need to change because they will obliterate those capable of influencing the general population to seek dialogue or fairness. With the recent confirmation that yes, indeed, USA and the other partners, spy on the whole world, keeping a dossier on each person, handy with those resisting land grabs veiled as progress, it is imperative we demand encrypted communications by Default, not the opposite that is been pushed: unique global device identifier transmitted constantly, wireless, not just phones…all gadgets, all machines. This is plain madness. and the issue here is not if we have something to hide, but the question is: Do we control our government, or it controls us? Another consequence of the G20 initiative, is the repressive agenda in which the members states go along with China, Turkey, Saudi Arabia, and adopt technologies and enact Laws that take away long standing rights and privileges. I give an example: In 2010, while visiting Argentina, now a leftist Country governed by former terrorists, a law was enacted that cars going 41 km/h over the speed limit, were impounded. Back in Canada, after 2 months, the same law was passed. even though the party in power is the far right Conservative Party. This clearly illustrates that politics is a charade and the global agenda takes predominance over local disgruntled citizens. Even when votes are against, the agenda keeps moving forward. Research it . Something you can corroborate. Therefore, is time to see we are the greater number, by virtue of sheer size we should reverse the destructive course plotted behind close doors by the elites, just as in previous centuries, do not like to share their wealth with humanity, and neither they want to relinquish power. Remember, they may be G8- G20 – Gwhatever. trying to decide our fate, but is not going last, because awareness is flooding the world, growing everyday. Exponential multiplication creates powerful numbers. If you dishonor, you will be thrown out of the European Union with your clicks and your clacks. So I’m just reading your comment in 2018 and I’m like a lot has happened during the last 5 years and we’re all still here, at the mercy of “superpowers”. Much like a cocaine addiction, a union feels great, at first. But by the time you realize what it’s going to cost, and that even if you could afford to keep feeding it, that it would destroy you… it’s extremely difficult to free yourself from. England managed to clean itself up. The road to recovery is always difficult – sometimes harder than keeping up with the quick fix. Reparations can be costly; getting back on the right path is harder than falling into the wrong one. But in the end, much like escaping a cocaine addiction, youll be healthier, you won’t be wasting your money on your self destruction, and you won’t be hanging out with the other junkies. This form of information and summarization gives me a clearer concept of the ideas telecast that can overwhelming and.dense to every day folk who wish to articulate,discuss and form an intelligent response to events.affecting our lives.